Alabama Gov. George Wallace (right) blocks the door of the the Foster Auditorium at the University of Alabama in Tuscaloosa, Ala., on June 11, 1963. Wallace, who had vowed to prevent integration of the campus, gave way to federal troops. 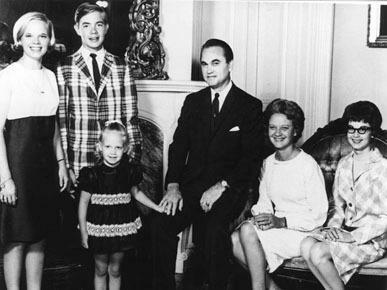 Peggy Wallace Kennedy with her family (from left) Burns Kennedy, Leigh Kennedy, Stephanie Rion Kennedy (wife of Leigh) and Mark Kennedy. The Wallace family in the mid-1960s. 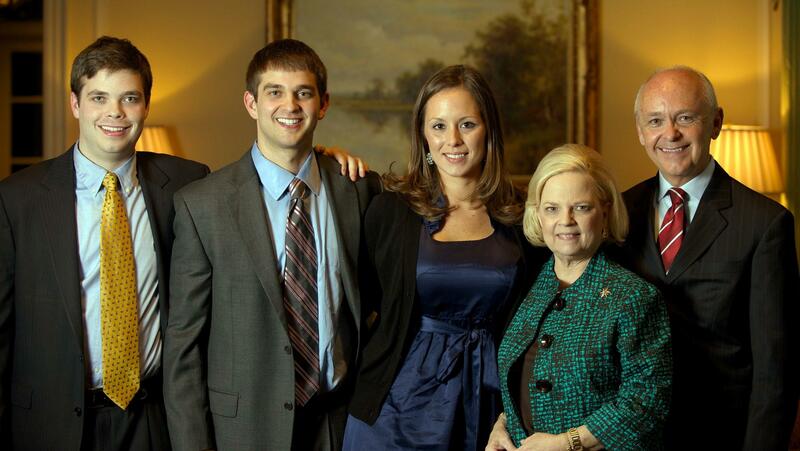 From left, Peggy Sue, George Jr., Janie Lee, George Sr., Lurleen and Bobby Jo. The legacy of the late Alabama Gov. George Wallace is shaped by these six words: "Segregation now! Segregation tomorrow! Segregation forever!" June 11, 1963, was the date of what has become known as Wallace's "stand in the schoolhouse door." The University of Alabama campus was transformed into a scene of chaos when two black students, Vivian Malone and James Hood, attempted to cross the color line and register for classes. The pair was surrounded by federal marshals, camera crews, jeering students and state troopers wearing helmets and wielding clubs. 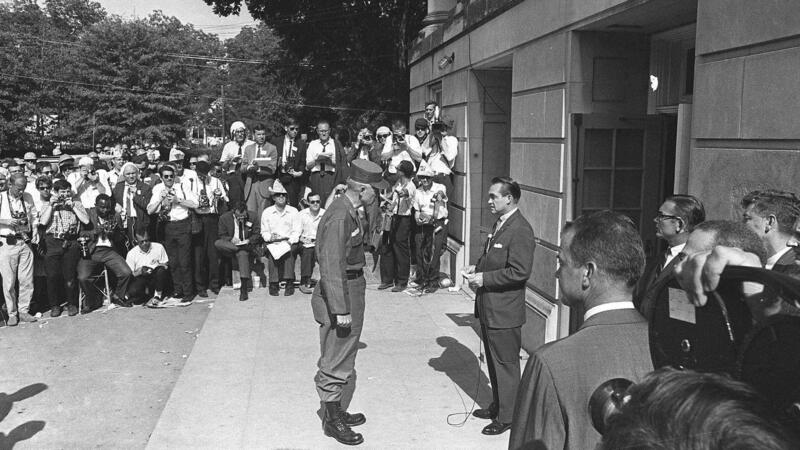 President John F. Kennedy had federalized National Guard troops to force Wallace to back down, but the governor refused and stood ramrod straight in the entryway. "I stand here today as governor of this sovereign state and refuse to willingly submit to illegal usurpation of power by the central government," he said. Wallace was more than just a governor. He was also a husband and father — and his family watched that day from a different vantage point. "Well, that day was a day that I remember quite differently than a lot of people," says Peggy Wallace Kennedy, George Wallace's daughter. She's now 63, but on June 11, 1963, she was just 13. "My mother and I went to Lake Martin, Ala. She had a small lake cabin there. I later realized that she ... had to come to the realization that after that day that all the hopes she had for a simple life were not going to come true for her," Wallace Kennedy recalls. "She would be in the shadow of the schoolhouse door, and I felt a sense of loss for her." At the time, Wallace Kennedy didn't understand that the episode would change her life. "[But] later on, of course, I did change. Because people ... judge me on what my father did," she says. Being the daughter of the politician who symbolized Jim Crow segregation has been hard on Wallace Kennedy, especially since she did not endorse his politics. "His decision to stand in the schoolhouse door ... seemed pretty illogical to me," she says. "He was a lawyer and a former judge. And I think he knew that his actions were for a lost cause. It seemed that he was kind of eager to make his political point and then step aside. "And maybe he did it to ... avoid a mob rule. But his actions that day marked him for life," she says. Gov. Wallace's life changed considerably after an assassination attempt in 1972. He survived the shooting but was confined to a wheelchair. As his health faded, his hard-line politics softened as well. Over the years, he issued a string of apologies and met personally with Hood and Malone, the University of Alabama students whose paths he tried to block. "We presented Vivian with the Lurleen B. Wallace Courage Award," Wallace Kennedy says. "It was in October of 1996. She and my father and James [Hood], they had a private meeting. "My father called her an icon of civil rights, of the civil rights movement, and how she had conducted herself with great dignity and grace. His eyes filled up with tears, and she reached over and touched his hand as a gesture of forgiveness," Wallace Kennedy says. But her father's early "segregation forever" stance overshadows everything else in his life, Wallace Kennedy says. "People in Alabama will remember his change from '72 until the day he died," she says, "but the world will always see that picture. Or you see his name and there will be an asterisk there, and they will know that that's the man that stood in the schoolhouse door." When asked if the 50th anniversary of her father's stand at the schoolhouse door provides her an opportunity to add her own voice to the historical record, Wallace Kennedy says yes. "Oh, I think so. I know I have found my own voice in the last couple of years." Indeed, Wallace Kennedy, who avoided the spotlight for years, is now using her voice to promote racial healing. She has marched with U.S. Rep. John Lewis across the Edmund Pettus Bridge in Selma, Ala., to mark the spot where he and others were beaten and bloodied in 1965. She is also using her voice and her name recognition to spotlight things that are not always popular in Alabama. She opposed the war in Iraq and was an early supporter of President Obama. And while many feel race is too touchy a subject, she encourages dialogue to promote understanding. "There will be no more schoolhouse door stands. There will be no more Edmund Pettus Bridge violence. There will be no more of that," she says. "We've come too far. We've got a long way to go, and I want to be part of that change. I hope and pray that my voice can help, just in some small way, to make that happen." Wallace Kennedy has also been thinking about legacy, her father's and her own. That becomes clear when she shares her six words for The Race Card Project: "I am a Wallace, but different." Wallace Kennedy is determined to leave a different legacy for two grown sons, she says. "I would like for them to be asked if they are the children of Peggy Wallace Kennedy before they ask if they're the grandchildren of George and Lurleen Wallace," she says. As we head into summer, NPR's also heading back in time to the summer of 1963. From the assassination of Medgar Evers to the March on Washington to the Birmingham Church bombing, 1963 was marked by civil rights tragedies and milestones. As part of our partnership with the Race Card Project, NPR's Michele Norris is talking to people who were on the front lines of history, getting their memories and thoughts on race in America. The Race Card Project asks people to distill those thoughts to just six words. Today, we hear from Peggy Wallace Kennedy, daughter of the late Alabama Gov. George Wallace, whose legacy is shaped, in this case, by six words. GOV. GEORGE WALLACE: Segregation now, segregation tomorrow and segregation forever. MONTAGNE: Now, Michele Norris looks back on how those words shaped a seismic event in civil rights history, 50 years ago today. MICHELE NORRIS, BYLINE: June 11th, 1963, was the date of George Wallace's "stand in the schoolhouse door," and here's how most American's remember it. NORRIS: The University of Alabama campus was transformed into a scene of chaos when two black students named Vivian Malone and James Hood attempted to cross the color line and register for classes. They were surrounded by federal marshals, camera crews, and state troopers wearing helmets and wielding clubs. NORRIS: President John F. Kennedy had federalized National Guard troops to force Wallace to back down, but he refused and stood ramrod straight in the entryway. WALLACE: I stand here today as governor of this sovereign state, and refuse to willingly submit to illegal usurpation of power by the central government. NORRIS: George Wallace was more than just a governor. He was a husband and a father. His family watched that day from a very different vantage point. PEGGY WALLACE KENNEDY: Well, you know, that day was a day that I remember quite differently than a lot of people. NORRIS: That's Peggy Wallace Kennedy, George Wallace's daughter. She's now 63, but on June 11th, 1963, she was 13. KENNEDY: My mother and I went to Lake Martin, Ala. She had a small lake cabin there. I later realized that she had to come to the realization that really, after that day that all the hopes that she had for a simple life were not going to come true for her. She would be in the shadow of the schoolhouse door, and I felt a sense of loss for her. NORRIS: Did you realize that your life might change also? KENNEDY: No, I really didn't. I didn't understand that it would change. And later on, of course, I did change, because people did, you know, judge me on what my father did. NORRIS: Being the daughter of the politician who symbolized Jim Crow segregation has been hard on Peggy Wallace Kennedy, especially since she did not endorse his politics. KENNEDY: Well, you know, his decision to stand in the schoolhouse door seemed pretty illogical, to me. He was a lawyer and a former judge, and I think he knew that his actions were for a lost cause. And it seemed that he was kind of eager to make his political point and then step aside. And maybe he did it to - maybe to avoid a mob rule. But his actions that day marked him for life. NORRIS: George Wallace's life changed considerably after an assassination attempt. in 1972, He survived the shooting, but was confined to a wheelchair. As his health faded, his hard-line politics softened. Over the years, he issued a string of apologies, and met personally with James Hood and Vivian Malone, the University of Alabama students whose paths he tried to block. KENNEDY: She and my father and James, they had a private meeting. My father called her an icon of civil rights movement, and how she had conducted herself with great dignity and grace. And his eyes filled up with tears, and she reached over and touched his hand as a gesture of forgiveness. NORRIS: But Peggy Wallace Kennedy says her father's early segregation-forever stance overshadows everything else in his life. KENNEDY: People in Alabama will remember his change from '72 until the day he died. But the world will always see that picture, or see his name, and there will be an asterisk there; and they will know that that's the man that stood in the schoolhouse door. NORRIS: That man's daughter has avoided the spotlight for years. But now, she's using her voice to promote racial healing. She has marched across the Edmund Pettus Bridge with Congressman John Lewis, to mark the spot where he and others were beaten and bloodied. She's also using her voice, and her name recognition, to spotlight things that are not always popular in Alabama. She opposed the war in Iraq. She was an early supporter of President Barack Obama. And while many feel that race is too touchy a subject, she encourages dialogue to promote understanding. KENNEDY: There will be no more schoolhouse door stands. There will be no more Edmund Pettus Bridge violence. There will be no more of that. We've come too far. We've got a long way to go, and I want to be part of that change. And I hope and pray that my voice can help, just in some small way, to make that happen. NORRIS: The Race Card Project asked people to distill their thoughts on race into just six words. On the 50th anniversary of the integration standoff at the University of Alabama, Peggy Wallace Kennedy has been thinking a lot about legacy - her father's and her own. That becomes clear when you listen to her six words on race. KENNEDY: My six words were: I am a Wallace, but different. NORRIS: Different - a woman determined to leave a different legacy for her two adult sons. NORRIS: That was Peggy Wallace Kennedy, the daughter of the late Alabama Gov. George Wallace. For more of her story, and more about the Race Card Project's six-word essays on race, visit our website: npr.org. I'm Michele Norris, NPR News. MONTAGNE: And that story included audio from the Robert Drew documentary "Crisis: Behind A Presidential Commitment."